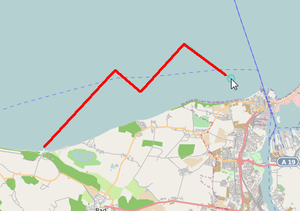 Waypoints can be clicked directly into the map an will be connected automatically to form a route. Waypoints will be written in a waypoint list, along with course and distance. Each section contains course and distance. Distances will be added to a total distance. overall distance as rhumb line and great circle (orthodrom). The voyage plan can be exported with positions, course and distance as CSV (auto pilot), GML and KLM file. Results can be displayed metrically or nautically (course and distance), export format can be presented.